If you're off to the store for a bit of shopping, grab a collapsible market tote on your way out the door. This ingenious product makes life just a bit more organized! 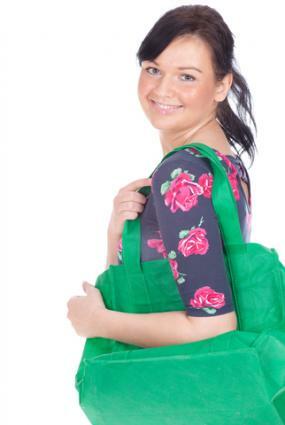 In recent years, reusable shopping bags have enjoyed immense popularity. Not only do they cut down on unnecessary usage of paper and plastic bags, they also hold a surprising amount of product with ease! Typically, reusable bags are constructed of heavy-duty materials, such as canvas or hemp, and are deemed extraordinarily functional. Thanks to their durability and roomy interiors, these bags generally serve a number of purposes. They're popular for everyday jaunts to the grocery store, but they even come in handy when trekking through the mall, running errands in town or just walking around the park with the kids. They're also usually inexpensive, and considering they're used time and again, they pay for themselves in no time! For those who fear they'll lose their fashion identities if they tote around a plain shopper, think again - today, the selection of reusable bags is impressively vast. There's something for everyone, from chic fashion mavens to low-key ladies. One of the more innovative reusable shopping bags to hit the market is the collapsible market tote. Its name certainly does it justice. This roomy tote bag is collapsible for easy storage, and is designed primarily for shopping at the farmer's market. You might even want to carry it to the grocery store to make toting your purchases home easier. (Bear in mind, though, that these totes are more like baskets, so carrying several at a time may not be practical; to that end, it's mostly useful if your grocery purchase isn't too big.) They also come in handy for picnics and gardening, and they're even spacious enough to be used as storage containers. Reisenthel Mini-Maxi Basket: Available in a variety of prints, this tote may appear as trendy as the latest It Bag, but you're bound to carry it for much longer! Functional and cute, this collapsible bag will serve you well for years to come. An interior zipper pocket allows you to store smaller items, like your wallet and cell phone, with ease. In fact, you may not even need your purse with this multifunctional, sturdy bag on your arm! Picnic Time Metro Basket: This interpretation of the versatile collapsible tote is just a little bit different. Designed primarily for picnic usage, it has an expandable drawstring top to keep the basket's contents covered. This can come in handy even when at the market, especially if it's a rainy day. Most of the collapsible totes available today are made of high-quality materials and should last you quite a while. Look for sturdy grips covered with some kind of cushion, whether foam or rubber, to make carrying easy. This will be especially helpful when your basket is filled to the brim! Protective feet will keep abrasion of the base to a minimum, and small details, like interior pockets, may also prove useful.